It is a gorgeous, gorgeous book, full of stylish, refined projects. 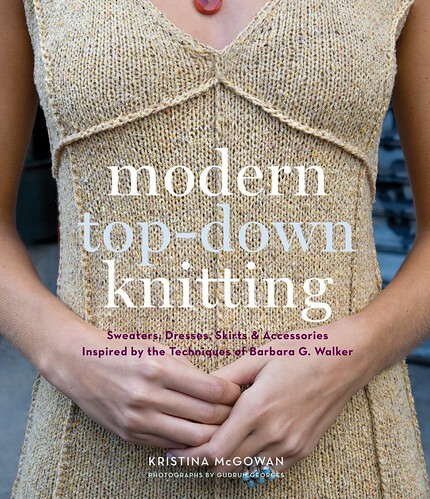 I am already a huge fan of top-down construction, but Kristina McGowan adds so many ideas beyond the typical raglan-sleeved sweater in this book. There are exquisite tops, dresses, skirts, sweaters, hats, and even two dressed-up versions of arm warmers, which I love. I had a hard time deciding what to knit from this book (I knew right away that I wanted to share a project from the book with you), but I finally decided on the Subway Hat, because I've been looking for a new hat for myself for a while. I have a small-ish head and have had trouble with some styles of hat looking good on me, so it's been tricky to come up with something I really liked. I did make one mistake, which was making the crown section too long before splitting it for the neck. I wasn't paying attention carefully enough, and once I realized it, I figured it would probably be OK. It is just fine, but it makes the back of the hat less neat and trim on the back of my head, which is all right, if not perfect. I loved making this, and I am really looking forward to making some more of the designs from this book. The attention to detail in each pattern -- from crochet edging and details, to the use of different trims -- is really lovely. Please be sure to visit the final two stops on the blog tour (tomorrow, December 8, at Knit and Stitch, and on Thursday, December 9 at Craftsanity). And ... I have a copy of Modern Top-Down Knitting for one of you! Please leave a comment on this post by Monday, December 13, and I'll draw a name and announce the winner that afternoon. Good luck!